Cognitive impairment in mouse survivors of endotoxemia or sepsis is BDNF and TrkB responsive. (A) Memory impairment occurred in mice 7 days after i.p. administration of LPS (10 μg/g BW), as demonstrated by loss of freezing behavior (indicating a fearful memory of a previous paw shock) after contextual fear conditioning. (B) Living hippocampal slices isolated from mice 7 days after i.p. LPS administration (as compared with saline) showed impaired LTP, the BDNF-dependent neuronal process responsible for spatial memory. (C) A similar loss of LTP was also seen 7 days after CLP, a model of polymicrobial peritonitis–induced sepsis. Loss of LTP occurred 7 days after LPS, despite (D) maintenance of hippocampal BDNF content and (E) preserved responsiveness to excess (100 ng/ml) exogenous BDNF. 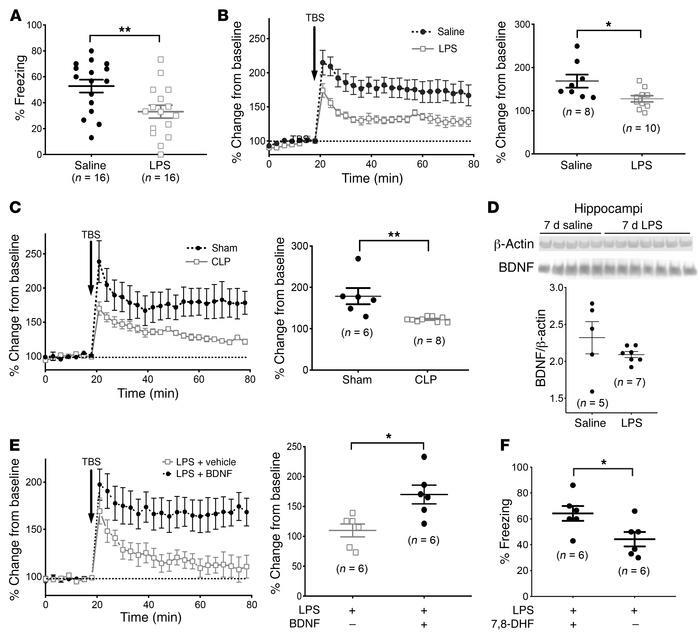 (F) Maintenance of the BDNF-responsive molecular machinery of learning after sepsis was further demonstrated by reversal of memory deficits in post-LPS mice treated daily with 7,8-DHF (5 μg/g i.p. ), a direct agonist of the BDNF receptor TrkB. *P < 0.05 and **P < 0.01, by t test. For LTP measurements, the left panels represent the mean ± SEM of groups; the right panels represent the average change from baseline over the final 10 minutes of measurement (each data point represents a unique biological replicate). TBS, theta burst stimulation.